5.3 So, what’s the problem? Any broken rule should be immediately noted and if possible righted. If somebody absent-minded stored some widget inside the fume hood, take it out and put it in the person’s samla. If somebody seems to be working by themselves on an experiment, ask if you can be their buddy or inform the kaiser of this. Maybe their chem buddy got sick and they’re still cleaning up but they forgot to tell anyone. Everything that happens with the fumehood of any significance should be reported to one responsible person: mux. By request you can get his e-mail, phone number, Signal, Hangouts, whatever you like. Just ask on IRC or in person, or any other way you see fit. Depending on your experiment, you may either just go ahead, or you may have to schedule a time where either a trained chemist or experienced person is available as well to observe the experiment. The focus of any application is on safety and clean-up. You will always be asked to reserve lots of time for prep and cleanup, so keep that in mind. The fumehood may be used to ventilate smelly things or accidents in the space safely without planning. All glassware is standardized to 29/32 ground glass fittings, for which we have appropriate clips. There is currently no up-to-date list of glassware, this is being worked on. The fume hood has been designed to work with floating lattice work. In order to build an apparatus, take out a nylon screw in a location where you want to put a bar and screw in one of the threaded M10 rods. You can now use either finger clamps or screw clamps (in the top 2 drawers) to attach glassware to your lattice. There should be plenty of room in the fume hood to build any apparatus you need, up to even fractional distillation setups, all floating above the work surface. There is a hot plate stirrer in the top-right drawer. This cannot be suspended, so place your boiling flask close to the work surface. Elevating the hot plate stirrer is not recommended, whatever you use for this is likely not going to be very chemically resistant or sturdy and you will just damage the HPS. Also keep the HPS away from corrosive atmospheres, as it is not a sealed unit! Wash and dry glassware, then return it to the correct positions in the drawers. Any broken or missing glassware should be reported, we don't bite! Use vaseline on ground glass joints to prevent them sticking together. In experiments that use sulfuric acid, use concentrated sulfuric acid instead. Carefully clean the joints afterwards if you lubricate them with sulfuric acid! We have a vacuum pump; it is a carbon vane type that cannot produce a particularly strong vacuum. It has been attacked by an HCl/HNO3 atmosphere and rebuilt, but has suffered significantly. It can be used for vacuum filtrations, but not much more. Use a bubbler when vacuuming off noxious atmospheres! The inventory if glassware and hardware is currently being compiled and supplemented. Work in progress. Chemical reagents (except for distilled water, isopropanol, waste, and temporarily stored project chemicals) are listed on the inside of the yellow locker cabinet doors to the right of the fume hood. Each bottle is labeled with a number (1-5) corresponding to the appropriate level of the cabinet it should reside in. A digital inventory of the fume hood is also kept on Quartzy: Quartzy: Department of Chemistry. (you need to log in to access this so ask Mux or PeterC to email you an invite). All liquids need secondary containment, this is provided by the glass trays found in cabinets 1,3,4, and 5. The bulk of the solids in chemical cabinet 2 are in small samlas, this means that you must carefully take out the samla to access the chemical inside. If you need chemicals that we don’t have for a project and don’t know where to source them you can ask mux or PeterC. If anything breaks, is added, runs out, and mux is not available to manage this, just put it under the Current Affairs section of this page. Significantly radioactive materials are absolutely forbidden. Yes, we have asked and the answer is a very empathetic no. And if anybody even tries, there are very hefty fines and prison sentences attached. This even goes for depleted ores. Constructing a fume hood on a tight budget isn’t that easy as we found out. 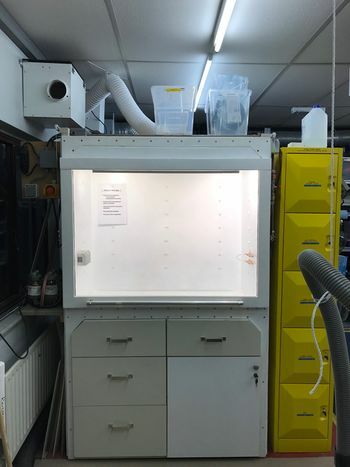 The construction of this fume hood was plagued with things that didn’t quite go right and had to be fixed - so let this story be both a cautionary tale and a guide to doing things better than we did! The main function of a fume hood is to be a relatively chemically inert space that contains any hazardous chemicals used or created in chemistry experiments. Things will go wrong, and if they do, the fume hood is there to protect both the operator and the rest of the hackerspace. The fume hood provides an approx. 50cm deep, 100cm wide, 95cm tall workspace, with 4 drawers and a lockable (though not particuarly secure) compartment. The fume hood has a single, balanced, vertically travelling window. The extraction fan; rated at approx. 100m3/h, it has the capacity to remove the entire volume of the fume hood every 30 seconds or so. For maximum airflow, make sure the window is NOT completely closed. The glass fiber liner. The entire inside of the fume hood is lined in glass fiber reinforced polyester, which is chemically inert to pretty much everything (see prohibited chemicals below). The hardware mounting holes are closed off with nylon screws. The lip; any spill (or coolant leakage) up to approx. 20L will be contained by the 4.5-cm lip. The polycarbonate window. The window is shatter-proof and mounted flexibly, so any explosions should be contained and - worst case - cause the entire window to be blown out instead of lots of small shards. Suspended latticework to put an apparatus on; any spills will automatically drop down onto the work surface out of the way of other reagents. The wooden frame, after assembly, parallellogrammed to make the entire fume hood crooked. This had to be corrected by screwing on a solid steel sheet frame to the front of the fume hood. The glass fiber liner did not finish very evenly, even with a layer of (pigmented) gelcoat. Ideally, the fume hood should be a very even glossy white on the inside, but this finish could not be attained. The patchy appearance of the gelcoated glass fiber was fixed by painting the inside, but the paint is of course a lot more reactive than the glass fiber, so in particular acid spills will leave visible marks instead of wiping off easily. This is not a safety hazard, just an aesthetic problem. The drawer rails, despite being rated up to 60kg, had trouble dealing even with the weight of the drawers themselves when fully extended and did not operate smoothly. This was fixed with telescoping rails. The first window did not operate smoothly. Neither did the hotfix for that window. This was fixed by rebuilding the window on telescoping rails and adding counterweights. A filter box was designed (and still hangs on the wall), to be filled with variously activated charcoal filters. Unfortunately, this proved to be quite ineffective as a general purpose filter. The initially planned military-grade filter cans went out of stock the week we tried to purchase some. In the end, we figured maximizing airflow is a better approach than trying to chemically trap any problematic atmospheres. These points by themselves aren’t the end of the world - they were mostly consequences of trying to construct a cheap fume hood - which was still successful. The biggest issue was a lack of time. Construction was supposed to be a team effort, but a confluence of factors (most notably: trying to plan anything big in a hackerspace) meant that time for construction was limited and the project proved too big for the main constructor. This let the project timeline drag on for about 9 months longer than it was supposed to, almost axing the project entirely. Add a faceplate to the top of the fume hood so the pulley mounting and wiring isn't visible and, more importantly, so people aren't as likely to put stuff on top of the fume hood. This page was last modified on 11 December 2018, at 21:56.